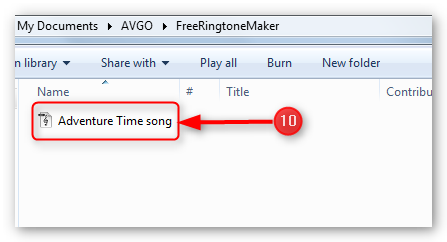 Learn the easiest way on how you can create or make ringtone for free with AVGO Free Ringtone Maker. 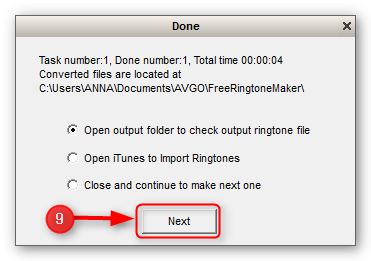 AVGO Free Ringtone Maker is a cool and simple freeware tool that allows you to take your favorite melodies or clip audio from a video file and convert them into a ringtone format compatible with your iPhone, Samsung mobile, Nokia mobile and more. It can make ringtone for free from any audio or video files (such as .mp3, .m4a, .wav, .wma, .avi, .flv (YouTube Format), .mp4 (iPod Video Format), .wmv, .mkv, .rm, .ra, .mov, DivX, XviD, 3GP, etc.). Have fun creating your personal, hip and unique ringtone for your iPhone, Samsung mobile, Nokia mobile and more for free with AVGO Free Ringtone Maker. 1. Click “Open File” button to add the audio/video file you want to convert. 2. After selecting the file, set the output format (.mp3, .m4r, .wav, etc.) via the “Output Profile” drop down box. 3. You may set the “Begin point” arrow and “End Point” arrow to trim/clip any part you like. 4. You can also Move the “Audio Fade” slide bar to set the fade in/out percentage. 6. Be sure to set the output path to your preferred output folder in your computer. 7. Once you are done and satisfied with the settings you made, you are now ready to make ringtone for free. Kindly click on the “Create Ringtone Now” button to start conversion. 8. You can view the progress of the ringtone conversion from the progress bar as shown below. 9. When the conversion is finished, you will get a dialog box where you will be asked what you want to do next. After making the choice, just click the “Next” button to proceed. 10. Congratulations! You may now transfer the ringtone you created to your mobile phone.